I love seeing high school athletes succeed in college and beyond. The first taste of that was when I worked in New York and I got to see Ray Rice (I didn't cover his games often) go to Rutgers and now with Baltimore Ravens. There aren't many that make it to that level, but I still enjoy the success stories. When it comes to baseball, there are very few who have made it to the big leagues from where I work now in southern New Jersey. However, I did two stories this year on South Jersey guys making it to the show and being successful. The first was San Diego Padres' Greg Burke, who also had a stint with the Atlantic City Surf, an independent minor league team that doesn't exist anymore. The second was on AL Rookie of the Year Andrew Bailey. Both fun to talk to, but it's hard to be in a bad mood when enjoying the success they had this year. 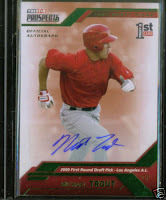 Next up on the radar of guys from this area is Anaheim Angels prospect Mike Trout. I've seen him play, and he's a heck of an athlete. I covered a few of his basketball games last year and he's a beast. I also saw him on Thanksgiving as he was at his high school's Thanskgiving rivalry game. I did a little search on eBay and found prospect cards for him already. Why all our local kids end up with California teams, I'll never know (there's another in the Giants organization), but if he makes it to the big club, I am sure MLB Extra Innings will have get even more subscribers from here. I have a Greg Burke card I need to get signed for my Padrographs. I'm really excited to see how Trout progresses this year in the Angels organization. He was tremendous in the Arizona Rookie League.